TOAST THE SPICES (CUMIN, CINNAMON, CLOVES) IN A DRY SKILLET ON MEDIUM FLAME UNTIL FRAGRANT. COOL AND GRIND TO A FINE POWDER. PUREE THE CARDAMOM AND NUTMEG POWDER, GREEN CHILLIES, 2 TEASPOONS SALT, GARLIC AND GINGER PASTE, THE POWDERED SPICES AND YOGURT TO A SMOOTH PASTE. USING A FORK PRICK THE CHICKEN PIECES ALL OVER. STIR THE YOGURT MARINADE INTO THE RAW CHICKEN. POUR THE MELTED GHEE INTO IT. MIX WELL. COVER AND MARINATE 6 HOURS OR OVERNIGHT IN THE FRIDGE. REMOVE AND STIR IN CILANTRO AND MINT LEAVES. COVER AND RESERVE. SET ONE LITER OF WATER WITH BAY LEAVES, CINNAMON STICK AND BLACK CARDAMOM TO BOIL ON A HIGH FLAME IN A LARGE POT. WHEN WATER REACHES A VIGOROUS BOIL ADD THE RICE, COVER POT AND SWITCH OFF THE FLAME. LET THE RICE SIT 8 MINUTES. RESERVE ONE CUP OF THE WATER AND DISCARD THE REST WITH THE WHOLE SPICES. STIR THE KHOYA, MELTED GHEE, MILK AND SAFFRON INTO THE RICE AND RESERVE. IF BAKING USE A LARGE DUTCH OVEN STYLE POT OR BAKING DISH ABOUT 10 BY 8 BY 4 INCHES. I USE A LASAGNA PAN OR A LARGE AU GRATIN. IF USING A PRESSURE COOKER OR RICE COOKER USE A LARGE, DEEP ROUND CONTAINER THAT WILL FIT INSIDE YOUR COOKER. GREASE DISH GENEROUSLY WITH VEGETABLE OIL. SPREAD THE CHICKEN ALL OVER THE BOTTOM. TOP WITH THE PARBOILED RICE. PAT DOWN AND SMOOTHEN THE TOP. COVER TIGHTLY WITH ALUMINUM FOIL FOR THE OVEN AND WITH A WATER PROOF LID FOR THE COOKER. BAKE IN A BAIN MARIE WITH 1.5 INCHES OF WATER FOR 2 HOURS UNTIL CHICKEN IS TENDER AND RICE IS COOKED. IF USING A STOVE TOP PLACE THE CONTAINER IN A PRESSURE COOKER AND STEAM 40 MINUTES ON A LOW FLAME UNTIL FULLY COOKED. SWITCH OFF FLAME OPEN PRESSURE COOKER AND REMOVE PULAO. SPOON INTO A LARGE SERVING DISH. TOP WITH CRISPY ONIONS JUST BEFORE YOU SERVE IT. 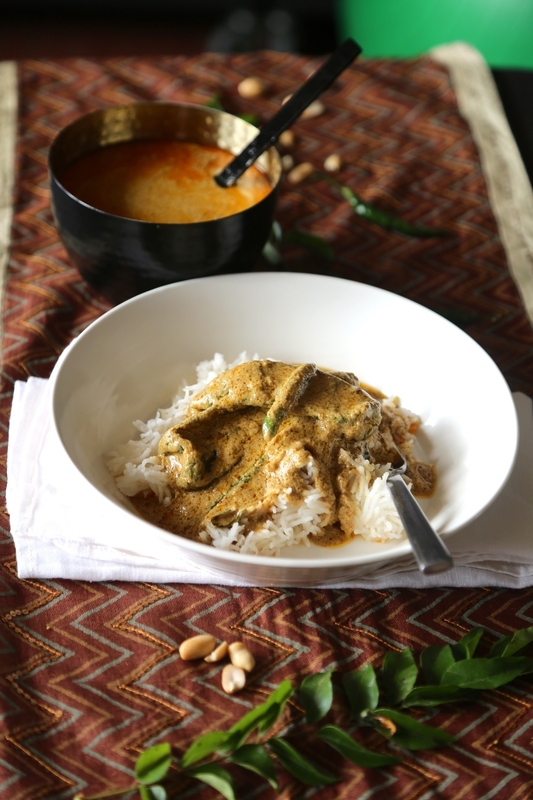 MY VERSION OF THIS HYDERABADI DISH, MIRCH KA SALAN IS A LIGHTER VERSION OF THE CLASSIC AND USES ABOUT A THIRD THE OIL OF TRADITIONAL RECIPES. I ALSO USE 2 VARIETIES OF GREEN CHILLIES. 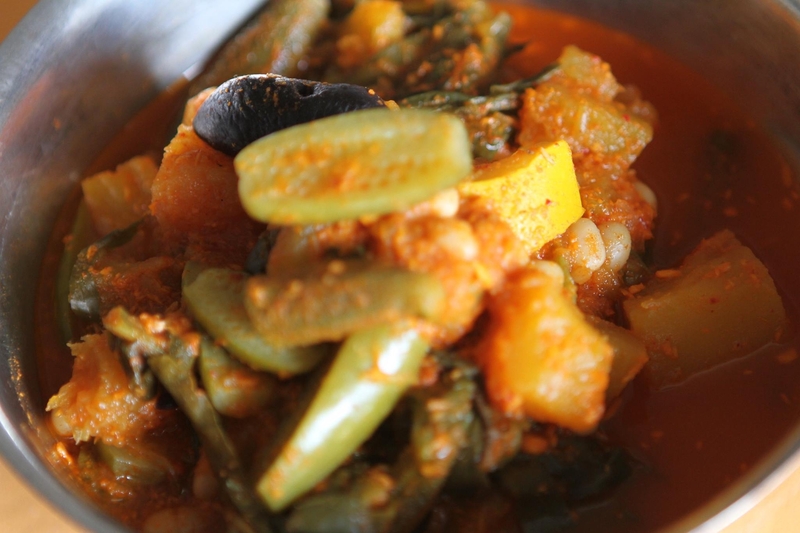 MIRCH KA SALAN CAN BE EATEN WITH LIGHT PULAOS, BIRYANIS, ROTIS OR JUST PLAIN BOILED RICE. IN A DRY SKILLET ON MEDIUM HEAT ROAST THE COCONUT 2-3 MINUTES. ADD THE PEANUTS AND TOAST ANOTHER 2-3 MINUTES. COOL AND GRIND TO A SMOOTH PASTE. RESERVE. THE REMAINING INGREDIENTS FOR THE SPICE PASTE AND ROAST, STIRRING REGULARLY FOR ABOUT 5-8 MINUTES UNTIL THE SPICES ARE GOLDEN AND FRAGRANT. COOL 10 MINUTES AND POWDER TO A VERY SMOOTH CONSISTENCY. ADD TO THE COOCNUT AND PEANUT MIX AND GRIND AGAIN TO FORM A SMOOTH SLIGHTLY CLUMPY PASTE. IF YOU ARE HAVING TROUBLE GRINDING IT ADD A FEW TABLESPOONS OF WATER AND GRIND TO A SMOOTH PASTE. HEAT 2 TABLESPOONS OIL IN A MEDIUM KADAI OR SKILLET. ADD CURRY LEAVES AND COOK 30 SECONDS. ADD THE LARGE GREEN CHILLIES AND SAUTE 2 MINUTES UNTIL BLISTERED ON ALL SIDES. ADD THE SPICE PASTE AND STIR VIGOROUSLY. ADD 2 CUPS OF WATER, JAGGERY, SALT, TURMERIC AND TAMARIND CONCENTRATE. LET SIMMER 3 MINUTES ON A LOW FLAME. ADD THE REMAINING 4 GREEN CHILLIES. THE SAUCE WILL THICKEN CONSIDERABLY. ADD MORE WATER TO CREATE A GRAVY THAT CAN BE SPOONED OVER RICE. Heat the 1/2 cup of coconut or vegetable oil and fry the plantain till crisp. Drain well, pat dry with paper towels and reserve. In a dry skillet toast the red chillies until fragrant on a slow fire, about 1-2 minutes. Cool and powder finely. Stir into the yogurt with the salt. In a pan cook the yogurt and chilli powder for 5-8 minutes on a medium flame. Grind the coconut, rice flour, jaggery and the green chillies to a fine paste. Lower flame and stir coconut paste into the yogurt. Cook 3-4 minutes. Remove from heat and transfer the contents to a serving dish. Top with the fried plantain. Heat 2 tsp of the leftover coconut oil on a medium flame in a small skillet or tempering spoon. Add mustard seeds followed by cumin and dried red chillies. Finally add the curry leaves. Cook about 1 minute until fragrant and toasty. Pour over the curry. Mix well. 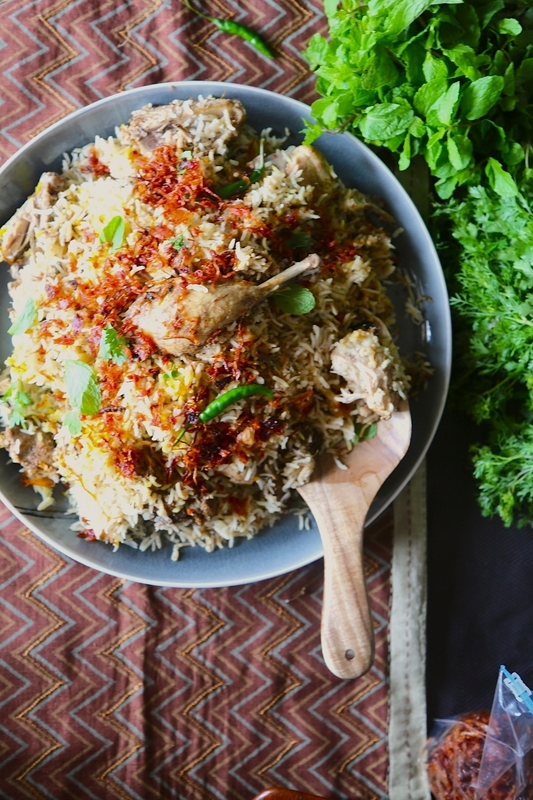 Serve with red or white rice and papaddums. 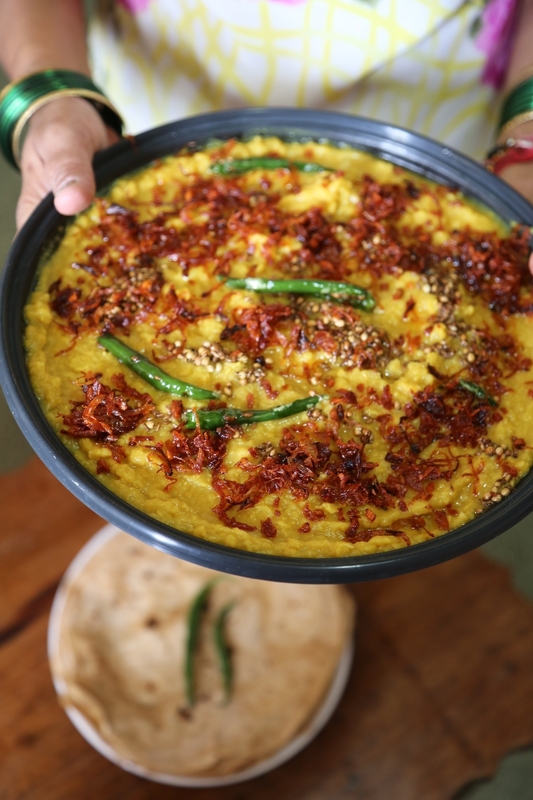 I make this Dal for friends when Im back in my NYC kitchen. Its simple and quick and always a crowd pleaser. Cook the yellow lentils, salt, turmeric, jaggery and garlic in a pressure cooker in 1 liter of water for 6-8 whistles. Or boil in a large covered pot with 1.5 liters of water on medium heat until partially cooked. Switch off flame and let sit 25-30 minutes. Remove lid of pressure cooker or cooking pot. Stir lentils and cook again over medium heat until thick and creamy- about the consistency of pancake batter. If lentils are undercooked and you require more water add some a cup and a time and cook until dal is velvet soft. Place the hot lentils in a large serving platter. Spread about for an even top. Heat ghee or oil in a small skillet or tempering spoon on high heat. Add cumin, coriander seeds and cook 1 minute until golden and fragrant. Add green chillies and switch off flame. Allow chillies to cook in the oil's heat. Slowly pour all over lentils. Garnish with crispy onions and garlic and sprinkle with red chillie powder. Serve with flatbreads like rotis or parathas. salt, jaggery and red chilli powder to taste. Roast all the spices and coconut in a dry skilet on low flame about 5-7 minutes until toasty and fragrant. Stir to prevent burning. Cool and grind to a smooth powder. Reserve. Cook the lentils in a liter of water with the turmeric and 2 teaspoons salt on a medium flame until tender and soft in a large cooking pot. 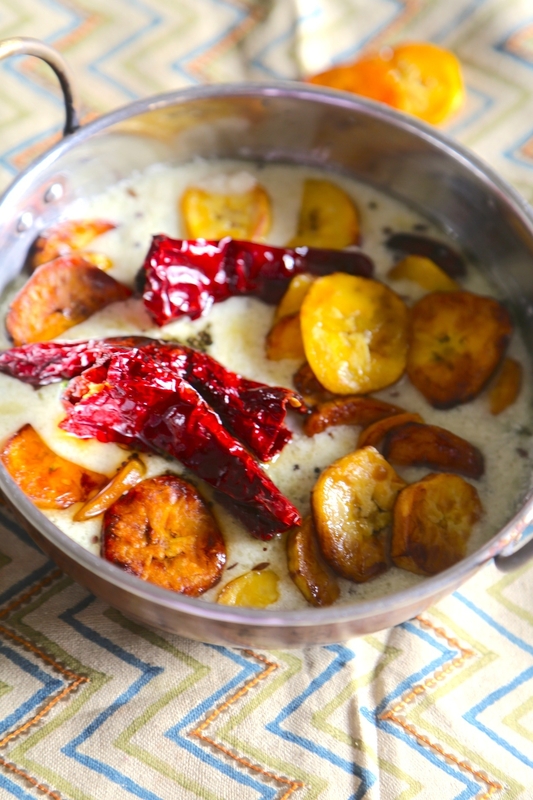 Add the potatoes, plantain, breadfruit and crushed teppal or tirphal, coconut spice paste and cook about 10 minutes on a medium flame. 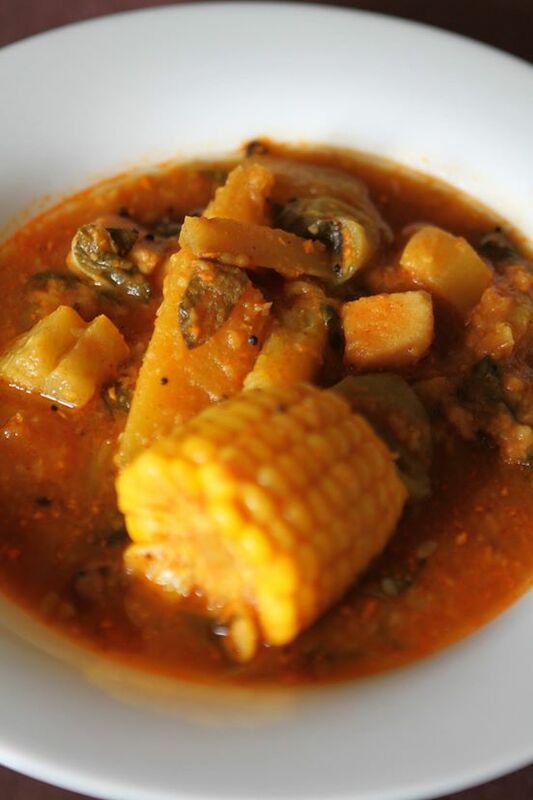 Depending on your choice of vegetables, gourds and beans add them in the order of the cooking time they take. Add the ones that take longer to cook first followed by the gourds and yam that take less cooking time and then the leaves. Add the kokum , ambado or tamarind, salt, jaggery and pumpkin and yam and cook another 2 minutes. Add all the remaining vegetables and cook. Khatkhate is a thick stew so don't add too much water. Stir in the coconut paste and peas. Bring to a simmer. Remove from heat, top with yogurt if preferred and serve. "Please consult your doctor about any health restrictions or allergies before enjoying this recipe." Soak the peas in water overnight. Then cook them on a medium flame until tender in a pressure cooker for one whistle or in a large, covered stock pot with enough water to cover the peas. Place the potatoes and crushed teppal or tirphal in kadai or large Dutch oven style pot with 2 cups of water and cook about 5 minutes on a medium flame. Depending on your choice of vegetables, gourds and beans add them in the order of the cooking time they take. Add the ones that take longer to cook first followed by the gourds and yam that take less cooking time. Add the kokum or tamarind, salt, jaggery and pumpkin and yam and cook another 2 minutes. Add all the remaining vegetables and cook. Khatkhate is a thick stew so don't add too much water. Gajbaje, a robust stew prepared without onions and garlic for Ganesh Chaturti is a medley of roots, tubers, greens and fruit. You can use cooking potatoes, elephant yam (surnu/suran), dried green or white peas, breadfruit (jeev kadgi or neer phanas), ivy gourd (tendli), beans such as dried green or white peas, cannelini, fava, navy, mangalore cucumber, also called Chinese cucumber (magge), yard long beans (alsando or eeiril), kantola/teasel gourd (phagil), ridge gourd (gosale), zucchini, calabash, daikon, beetroot, ash gourd or petha, red pumpkin, raw plantain (randayi kyale), white radish, sweet potato (kanag or ratale), amaranthus, taro or radish leaves. Toast the red chillies, rice and coconut in 2 tablespoons of coconut oil over a medium flame until golden and fragrant. Grind to a fine powder. Add tamarind and grind again. Reserve. Cook beans with 2 teaspoons of salt in a liter of water about 20 minutes on a medium flame. Add potatoes and cook another 15 minutes. Add all the remaining vegetables, the coconut paste and more water if required. Cook until vegetables, gourds and beans are tender. Heat oil or ghee in a skillet on medium flame. Add the mustard seeds, asafetida and cook 60 seconds. Add the curry leaves and cook 30 seconds. Stir oil and spices into the vegetables. Add salt, jaggery and more tamarind as per your paste.